A parenting manual taking us through the major Bible principles for family life. Read an independent review from The Gospel Coalition. Numerous books set out to help Christian parents in the challenging mission of raising their children well—so what's different about this one? Well, the answer's in the title! It's not about how the gospel fits into Christian family life, but how family life should fit into the gospel—God's greatest purpose for this universe, achieved in Christ. Many books aim to raise up competent, balanced parents and well-trained, well-rounded children. But Tim Chester and Ed Moll focus on families growing God-knowing, Christ-confessing, grace-receiving, servant-hearted, mission-minded believers—adults and children together. - not just parents and children, but being an integral part of the wider church family. 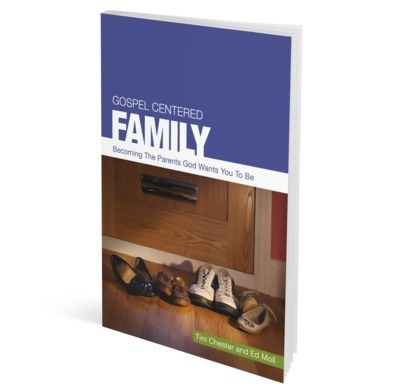 In twelve concise chapters, Gospel-Centered Family takes us through the major Bible principles for family life, challenging us to give up our 'respectable' middle-class idols, and to become the distinctively different people that God, through his gospel, calls us to be. Your family can show how great it is to live under God's reign of love. Knowing God is far more important than getting on in life. The biggest obstacle to good discipline is our own selfish hearts. Trying to be a good parent will crush you if you don't embrace grace. Changing hearts matters more than controlling behaviour. Don't train your child to be a legalist. Make sure you enjoy your children! Teach your children about God in the context of everyday life. Shape what younger children watch and how older children watch. Teach children to pray by praying with them. We belong to two families. Children are not the centre of the world. Tim Chester understands what it means to live the Gospel of Jesus Christ in your daily life. So, in this very practical book about family life, he shows what it means to rest in grace as parents, to respond with grace to our children and to teach them to hope in grace themselves. This book is a must read for parents. It brims with encouraging grace and practical direction on every page.